Most homeowners believe that their heating and cooling systems are two different systems. While this is common in most homes, it is not the only option you have. Do you want an energy efficient heating system? Call (937) 488-4758 and find out about our industry leading Springfield heat pump solutions. From installations to repairs, our staff has got you covered. At CJS Heating & Air, we offer customers in and around Springfield, high quality heat pump solutions. From installation to repairs, our technicians will be able to work with you in order to make the most of the heating and cooling of your home. Our goal is to provide you with the highest quality solutions that work for your needs and budget. Save time and money by using our CJS Troubleshooter to diagnose common system issues. Heat pumps are one of the most versatile appliances that can be installed in your home because of their ability to work both as a heating and cooling mechanism. These systems mainly work by transferring air from one area to another. In the winter, they will take warm air from the outside areas around the home, and pump it into your home. This provides you with warm air when you need it most. Similarly, in the summer, heat pumps work by removing hot air from the inside of the home, and pumping it outside. This can also help to combat humidity and discomfort, which are leading issue in the summer months. There are no additional pieces needed to allow a heat pump to function for both heating and cooling. Rather they function as needed, providing you with the temperature control you would want in your home. How can this system benefit your home? Energy Efficiency – Because heat pumps function by transferring air from one area to another, they are much more energy efficient than traditional systems. Traditional systems create hot air on their own, while heat pumps bring it into the home from outside sources. Versatility – Heat pumps are a very versatile system to have in the home because they function both to heat and cool the home. This also means less large machinery in your home, which can give you ample storage space and room to make other additions to your home. Longer Lasting – Another great advantage of a heat pump is its longevity. Since there are less internal parts working to heat and cool air, heat pumps are less prone to sustaining damage. Additionally, with regular maintenance, you can extend the life of your unit easily. To enjoy these benefits, and to get the heating and cooling solutions you deserve, give our staff a call. Since 1994 we have been providing customers with expert heat pump solutions tailored to their needs. If you want this same level of customer care, then it may be time to give our professionals a call. What are signs that your unit needs repairs? 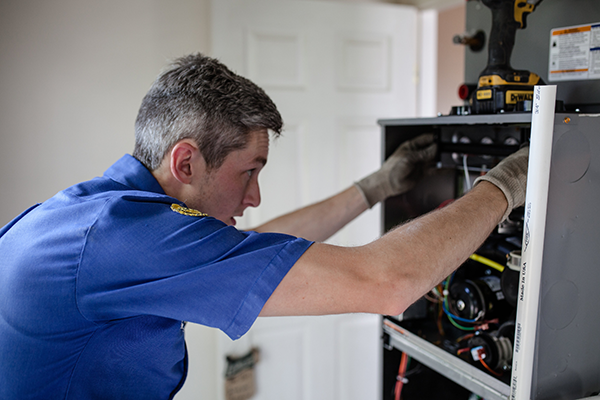 At CJS Heating & Air, we have the latest training and skills needed to perform the highest quality heat pump repairs. We will arrive quickly, diagnose the repair issue, and perform the needed services to get your heat pump back up and running in no time! When it comes to your heating and cooling needs, no one puts customers first like our professionals. When you call us, we will get to work helping you immediately. From our customer care specialists that will assist you over the phone, to our heat pump professionals who will complete the the repair work, our staff goes above and beyond to help you. It is also helpful to know that we are there when you need us most. Whether your heat pump breaks down in the middle of the night, or on a holiday, we will be there to help you, guaranteed! By putting your trust in us, you will rest easy knowing you’re getting the best heat pump solutions. Are you looking for professional Springfield heat pump installation services? Need repairs? Look no further than our experts! Call (937) 488-4758 and find out how our clean, screened, trained and timely heat pump specialists can help you.